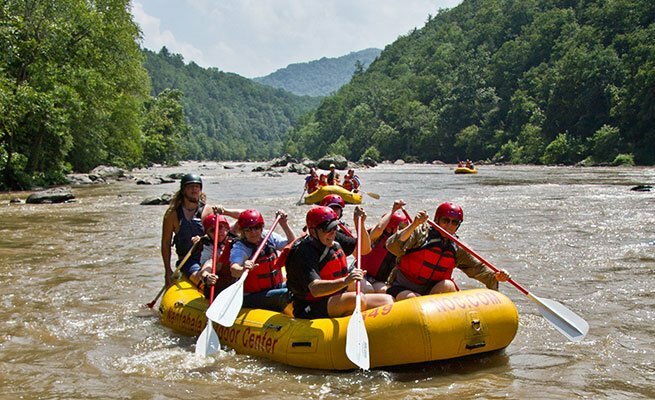 The French Broad River flows through Pisgah National Forest and the stunning mountains near Asheville, North Carolina. Whitewater rafting its 5 miles of exciting Class II-III rapids, swift-moving currents and raft-sized boulders provides a fun, refreshing day outdoors for the family. 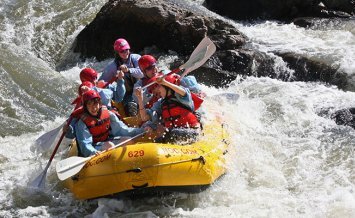 Class III rapids like S-Turn, Big Pillow, Pinball and Ledges are the highlights, and numerous Class II rapids keep the river trip busy in between. Rafters will have a chance to stop and enjoy the beauty of the world's third-oldest river during a short break at Ledges rapid. 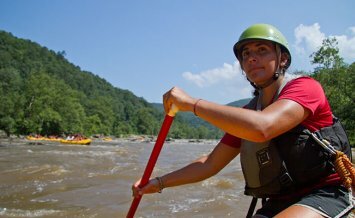 With warm water, big splashes, and wide mountain views, rafting the French Broad is one of the best things to do in Asheville. NOC provides all necessary gear and equipment. 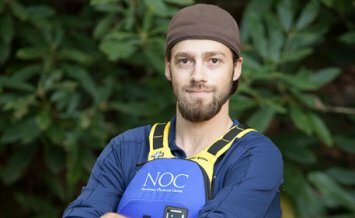 Tim Brainard Tim is a Pigeon River Head Guide and a designer of the 2013 ICF Canoe Freestyle World Cup Feature. 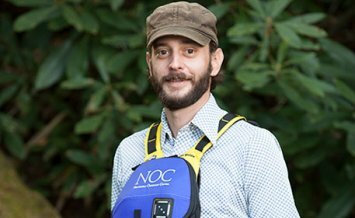 Craig Sanslow Craig has checked out on 6/7 NOC Rivers and is the French Broad River Manager. 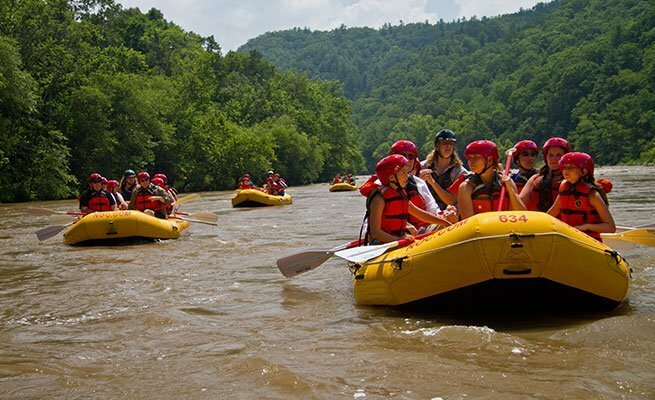 NOC's French Broad Rafting Outpost is located in Walnut, North Carolina, off Highway 25 near Asheville. With ample parking and a welcoming porch, it's a great place to relax before and after your Asheville rafting trip on the French Broad. 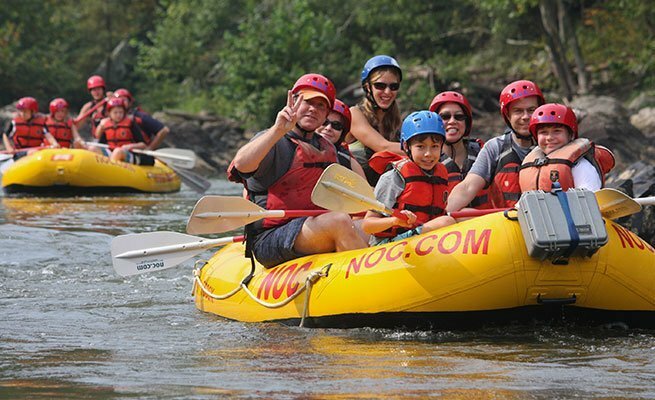 All French Broad River trips depart from our French Broad River Outpost, located between Weaverville, NC and Hot Springs, NC. 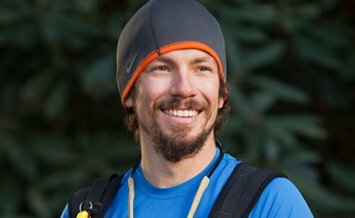 The outpost is 25 miles NW of Asheville, NC, and 75 miles E of Gatlinburg, TN. From Asheville: From I-240 take Exit 4A onto US 19/23 North. Drive nine miles, then take exit 19A onto Hwy 25/70 toward Marshall, NC. After 8.5 miles, the road changes from four lanes to two. Continue another 6.5 miles and you will see the NOC buildings on the left. The parking lot entrance is at the top of the hill. Please note: Hwy 25/70 is a scenic byway and signage is limited. If you pass the red Walnut VFD building, you've gone too far. From Tri-Cities: Take I-26 East from Johnson City, TN. At Mars Hill, NC, take exit 11 onto Hwy 213. Follow Hwy 213 for approximately eight miles until you reach the junction with Hwy 25/70. Turn right onto 25/70 towards Hot Springs, NC. AB Tech College will be on your right. After about five miles, NOC will be on your left. The parking lot entrance is at the top of the hill. Please note: Hwy 25/70 is a scenic byway and signage is limited. If you pass the red Walnut VFD building, you've gone too far. From Knoxville: Take Hwy 25/70 South from Newport, TN through Hot Springs, NC. Our meeting place is on Hwy 25/70, approximately 11 miles past Hot Springs. The parking lot entrance is on the right, 0.9 miles past the Walnut, NC turn-off sign. Watch closely! The entrance can be difficult to see traveling from the west.